Always had a thing for big dogs? Do you know what the largest dog breeds are? Here is an overview of the 25 largest dog breeds. You will be amazed at the diversity among them. Some have been bred to hunt large animals, others to survive in extreme conditions, and there are some which have been bred large so as to intimidate intruders and be better guard dogs. No matter how intimidating some of these large dogs may look, in general, larger dog breeds are usually loving, loyal, relaxed and mild-tempered animals. This makes them excellent pets! Properly socialized and trained, large dogs can get along with all of your other pets, with the kids and with all of the members of your family. The fact is, that being large animals, these dogs will most probably prefer to take naps all day long, as long as you provide them with the daily walks and exercise they need. This makes them perfect for homes with big yards, and even for smaller ones and apartments. But, their size and their instincts to protect or hunt can be a problem to deal with if you have little or no experience with dogs at all. So, even though there is no general rule about which dogs are large, here are 25 of the largest dog breeds, which are all seriously big pups. The Caucasian shepherd dog was first bred in the Northern Caucasian area as a guardian dog. It reaches up to 30 inches at the shoulder and a weight of up to 130 lbs. and is everything but a lap dog. It is a strong boned and muscular dog which is fierce, fearless and self-confident whenever there is a threat. Otherwise, it is a devoted, soft and kind mannered pet which can get along very well with the entire family as well as with other pets. Caucasian Shepherds have been used for centuries for protecting properties, livestock from predators (even from bears) and for other duties. Today, they’re mostly used as watchdogs or companions. There are many variations of this breed. Two of the most popular ones are the Mountain type with a long coat and the Steppe type which have a smaller body mass and a short coat. Given its nature of always feeling the urge to protect its family, the Caucasian Shepherd dog is definitely not a dog for first-time dog owners. It needs very serious training and socializing, in order to prevent incidents of the dog attacking other people because it is protecting you. When properly trained to understand that all members of the household are before it in the pack, the Caucasian Ovcharka will become an immensely devoted, loyal and loving member of your family. Do keep in mind that it is incredibly strong, so you shouldn’t let children or elderly people walk the dog. The English Mastiff is the heaviest dog breed. The heaviest dog from this massive breed named Zorba weighed a massive 343 Lbs. An average mastiff can reach a height of 27–30 inches at the shoulder and a weight of 130-220 lbs. So, if you are looking for the biggest dog breed in term of mass, then the definite winner is the English Mastiff. Being bred as a working dog for blood sports such as baiting bulls, bears and even lions, the size and the mass of this dog is crucial for this purpose. Back in the Roman Empire, Caesar was so impressed by the Mastiff when he invaded Britain, that he reportedly took back a few dogs back home, where they were used in lion and gladiator fights. But today, the large-headed, huge Mastiff is mostly preferred as a loving and gentle family pet and companion. Dogs from this breed are also often used as therapy dogs, as well as for search and rescue, weight pulling and tracking. It has a mellow, loyal and even-tempered nature and is great for families with kids, who will enjoy playing with their gigantic friend. It needs to be with its people because long isolation can lead to destructive behavior and anxieties. Mastiffs will require daily walks, and a lot of training and attention if you want the entire family to feel happy. Unlike many of the other large canine breeds, the Newfoundland was bred as a fisherman work dog, and not a guard dog. These huge adorable dogs were used to assist fishermen on boats and could haul lines and nets, as well as jump in the water to save people or restore items which had fallen off the boat. The Newfoundland is an impressive, strong water dog which can reach up to 200 lbs. The largest dog from this breed reportedly weighed 260 lbs.! Undoubtedly, the Newfies are among the best swimmers among canines. They are in fact still used in certain search and rescue water operations. They are highly intelligent and gentle-natured dogs which are usually black in color but can also be grey or brown. They look even bigger than they actually are thanks to their thick double coat which is meant to keep them safe and warm even in freezing waters. Newfoundlands are incredibly affectionate to their families and are especially gentle and protective with kids, which is why some people refer to them as Gentle Giants or Dog Nannies. They do require daily walks, exercise, and training, and it is advisable that you ensure a place where they can enjoy an occasional swim to keep them active and happy. You may have seen this eye-catching mop-like large dog before. The Komondor was originally bred in Hungary and used for guarding property and livestock. Today the breed has been declared a national treasure in its home country. You can never mistake this breed for any other thanks to the distinctive long and mop-like corded coat. Dogs from this fascinating large breed can reach up to 31.5 inches and weigh up to 130 lbs. They are not too suitable for apartment life, even though they are quiet and calm indoors. But it is in their nature to guard and roam outdoors, especially at night, so if you have a large backyard with a fence, you can get one of these dogs. Keep in mind that they do bark quite a lot and can be quite uncomfortable with strangers if not socialized and trained properly. Otherwise, Komondors are very loyal pets and are strongly devoted to all family members, and are especially patient with children and the family pets. Overall, like many of the other large working dogs, the Komondor is not suitable for people with any experience with dogs. It does require a lot of serious training and socializing as well as moderate daily exercise if you want it to stay healthy and stay out of trouble with the neighbors and other people and animals. The Scottish deerhound is one of the most ancient hunting breeds in the world. It originated from Scotland where it was used for red deer chasing and hunting. With its long, big boned legs and hound like structure, this strong and large dog can easily reach to its prey thanks to its amazing speed. These dogs are quite tall, with a height of up to 32 inches and a weight of up to 110 lbs. for males. Scottish deerhounds look like Greyhounds but with coats. Their long tails hang to the ground, and they can have either black or blue noses. The coloring of the coat can be in various color combinations, and it is harsher and wiry on the legs and body, and softer at the head, belly and the chest. An interesting fact is that the breed almost became instinct at one point in history when only aristocrats with high titles were allowed to own one. Thankfully, the breed was successfully restored in the 18th and 19th centuries. Dogs from this large breed are very loyal, gentle, loving and affectionate, and are very close to their families and friendly with strangers as well. They are very good with kids but should be kept away from other animals, due to their strong hunting drives. One of the best features of the Scottish deerhound is that it barks very little, which makes it a nice quiet large dog suitable for a family pet. They do require long walks, but not too much extensive exercise. The Neapolitan Mastiff is not as colossal as the English Mastiff but is still a very large and popular dog breed. Its proportions can reach 130 to 155 lbs. for males and up to 140 lbs. for females. 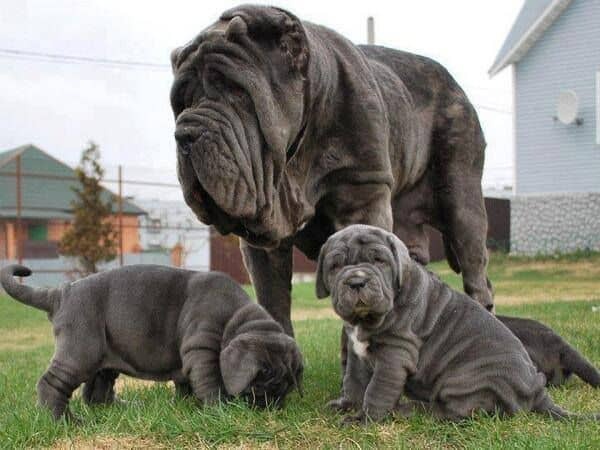 The height of an average Neapolitan male mastiff is between 26-31 inches. Their distinctive facial wrinkles, as well as their body folds, make them easily recognizable. Neapolitan Mastiffs are highly intelligent dogs which are very protective of their families and home, which makes them excellent guard dogs, but can pose problems if they are not socialized and trained right. They are not as reliable as alarms, as they tend to be discreet, and prefer to sneak up on potential intruders rather than bark. These dogs are definitely not appropriate for novice dog owners as they do need extensive socialization and training. 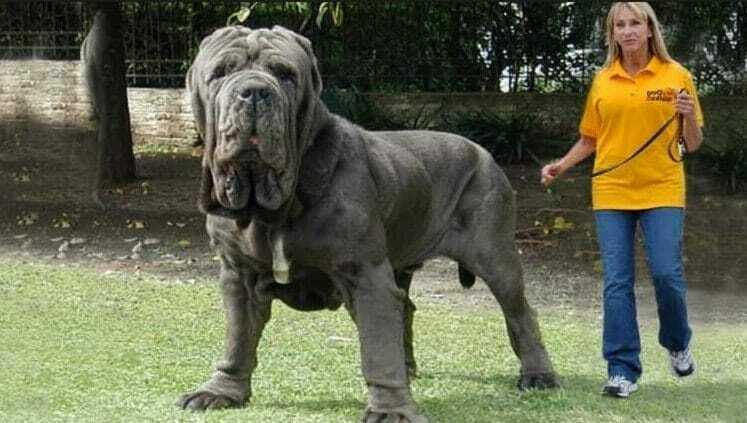 The ancestor of the Neapolitan Mastiff was the Roman molossus dog. Today, the dogs from this breed require human attention and love, and should not be left in isolation outdoors because this can lead to destructive behavior. They can go well with one long walk per day only and still feel happy. Overall, they are loving and calm animals which make great pets for families with grown-up children. The St. Bernard was bred in the Swiss and Italian Alps for mountain rescue operations by the monks in the Saint Bernard Hospice. They were used for clearing paths in the deep snow and for human rescue operations in the very snowy and dangerous St. Bernard pass connecting Switzerland and Italy. More than 2,000 people including Napoleon’s soldiers were saved in the last 200 years by dogs from this amazing large dog breed. One of the most legendary dogs from this huge breed named Barry reportedly saved nearly 100 lives in the mountains at the beginning of the 18th century. His body is exhibited at the National History Museum in Berne, Switzerland. These dogs are enormous due to the fact that they were used for walking through heavy snow and searching for avalanche victims and for lost people in the challenging mountain terrains. Dogs from this breed can reach up to 36 inches tall and can weigh up to 120 lbs. The record for the heaviest St. Bernard is held by a dog named Benedictine who weighed 366 lbs. Needless to say, they are highly resistant to cold and are very strong dogs with a great sense of direction. Today, instead of roaming in the mountains and offering people in trouble a sip of rum from the barrels on their necks, they are most popular as family pets. St.Bernards are very friendly, gentle and loving with children and with other pets. The Russian black terrier was created in the USSR prior to WWII and was used as a working military dog. It is a cross of 17 different dog breeds, and is a brainy and highly trainable working dog. The height of the males can reach 30 inches at the shoulder and their weight is up to 130 lbs. Their thick coarse, waterproof double coats protect them from freezing temperatures, which makes dogs of this breed suitable for colder climates. Overall, the Russian black terrier is a very courageous, calm and self-assured dog. It has a strong guarding instinct, which makes it a great watchdog. It is very protective of the children at home, and get along well with other smaller pets if they are raised together. But they are large, strong and muscular dogs which do need a strong trainer and leader, as well as extensive socialization due to the natural suspicion of all strangers. Also, they require intensive exercising, as they are very active dogs with huge energy and stamina levels. But they are quite sedentary when indoors, so you can get a Russian black terrier even if you live in an apartment. They shouldn’t be left outside or crated alone for long periods of time. 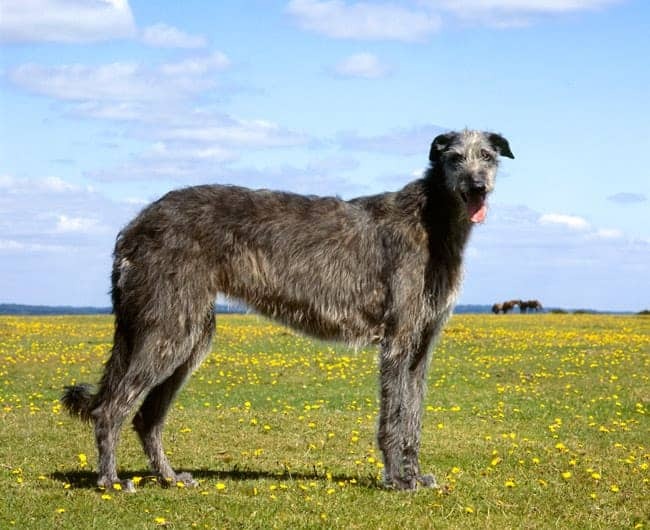 The Irish wolfhound is one of the highest dog breeds. The minimum stature of dogs from this breed is at least 34 inches, but their weight will rarely exceed 120 lbs. for males and 105 lbs. for females. The breed was developed for hunting wolves and for guarding. The first records of this breed are from as early as 7000 B.C. Irish wolfhounds can have varied personalities, but are often quite individualistic and have their personal quirks. At the same time, they are not notorious for being aggressive or to act impulsively. Today, Irish wolfhounds are popular family dogs which are known to be quite reserved, easygoing, intelligent and quiet. They don’t have problems with territorial aggression toward other dogs, but due to their hunting experience, they do tend to course other dogs. Irish Wolfhounds are generally quite gentle with children and are easy to train, but they are individualists which have been bred to hunt alone and far away from their owners. The Great Dane is widely considered as the largest dog breed, and while it is not the heaviest of the dogs (100-120 lbs. ), it is definitely among the highest ones. The height of the average Great Dane is about 28 to 30 inches, but it can be taller. In fact, a dog from this breed named Zeus still holds a record as the highest living dog with a height of 44 inches. Unfortunately, as with other giant dogs, the lifespan of the Great Danes is only about 6 to 8 years, even though some dogs can live to 10 years and older. The aforementioned Zeus died at the age of 5 from old age in 2014. These giant dogs are friendly to familiar people and other dogs and pets and are especially gentle with children. They are after all guardian dogs, so they shouldn’t be taken lightly. Great Danes come in various colors, with the most impressive ones being the black and white harlequin types. These gentle giants are elegant and noble-like creatures, which do require a lot of attention, training, and love. But they are people pleasers and will give back all of their affection and loyalty in return. The Leonberger is a crossbreed from St.Bernards, Newfoundlands, and Pyrenean Mountain Dogs. As you can imagine, the size of these canines is quite impressive. Even though they were bred as companion dogs, they are great dogs for rescue work, herding, and swimming. The average height of the males is about 29.5 inches, while females are usually about 27.5 inches. These dogs weigh about 140-150 lbs. The Leonberger has a striking, furry, water-resistant coat, and is quite a robust dog. It is very intelligent, loyal, kind and playful, which makes dogs from this breed perfect family pets. It does shed quite a bit so be prepared for dealing with all that grooming and cleaning if you add a Leonberger to your family. Unfortunately, they have a rather low life expectancy of just 7 years. But for its relatively short life, a dog from this breed will bring pure love and joy to your whole family. It will also attract a lot of attention when you go for a walk, so be prepared to be stopped by complete strangers who will want to pet it and take photos with it. 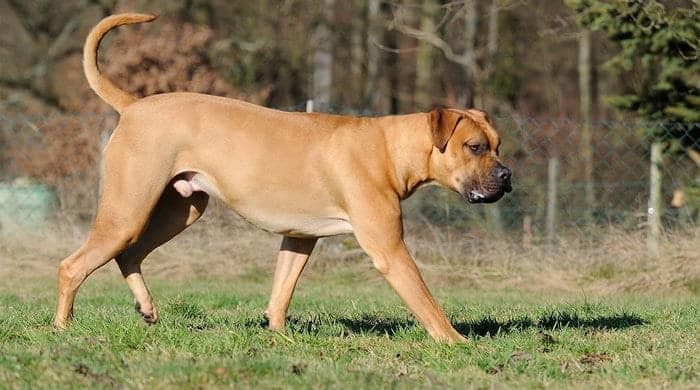 The Tosa Inu is a gigantic Japanese fighting dog, which resulted from cross-breeding of Japanese breeds and European ones, such as Mastiffs, Bull terriers, St.Bernards and Great Danes. Tosa Inus are sometimes referred to as Japanese mastiffs and even as Canine sumo wrestlers. The height of this rare dog can reach 32 inches at the withers and its weight among non-Japanese breeders is 130 to 200 lbs. In Japan, the dogs from this breed are typically smaller and weigh less. Tosa Inus have quite cute faces, thanks to the wrinkled foreheads and the brown sad eyes, but keep in mind that they were explicitly bred for fighting. They are incredibly robust and muscular and thankfully are not people-aggressive. Tosa Inus are very affectionate and gentle with kids but will have a tendency to protect them at all costs. If you choose to adopt a dog from this breed, make sure that you are prepared to spend a lot of time and energy training it, socializing it but without being too harsh, because this can have the opposite effect and make the dog unstable and unsafe for family life. They are easy to groom and have a rather long life expectancy of 10 to 12 years as compared to some of the other giant breeds. As its name suggests, the Bernese mountain dog originated in mountain farms in the Bern region in Switzerland. Apart from being very large, the most distinctive feature of this breed is the beautiful tri-colored markings on the coat and the face. Male Berneses reach a height of up to 27.5 inches and can weigh up to 125 lbs. and females are slightly smaller. In general, these beautiful dogs are very kind natured and docile dogs which are friendly with other pets and with children. Their affectionate and sweet nature is in stark contrast to their large and powerful build. They live to please their owners and will be happy to join you along wherever you go. At home, Berneses are calm and prefer napping, but being built for hard work, they do require long walks, exercise and play time. They are protective of their families but are not threatening to strangers. They will get attached to all family members, so there will be no jealousy among you when it comes to who is the dog’s favorite person at home! The Boerboel is a large dog breed originating from South Africa. Boerboel means “farm dog” in Dutch. Boerboels have a height of about 27 inches and higher and can weigh up to 220 lbs. They are perfect as companions and playmates for children and are kind and loyal to their family members. Although these dogs are very intelligent and obedient, they do have a strong territorial instinct, so they can be great watchdogs. Of course, like all other large dog breeds, you need to pay special attention to socializing and obedience training them to keep everybody safe. It is especially important to keep puppies away from aggressive dogs, in order to avoid your Boerboel pet from becoming defensive and fearful manner later on. Also, be careful when introducing strangers to your home, and make sure you introduce them to your dog before letting them in. They are intelligent and loving dogs but are definitely not recommended for first-time dog owners. Anatolian shepherds are believed to have originated more than 6,000 years ago in the Anatolia region of Turkey. They were bred and used for guarding flocks without their owners nearby, which is why it is crucial to properly socialize Anatolian shepherd pups when they are young. The height of these large working dogs can reach over 31 inches and their weight over 150 lbs. for males, and slightly smaller for females. Their impressive thick coats make them look even larger. The life expectancy of dogs from this breed is longer than that of many of the other large breeds and is about 11 to 15 years. In Turkey, the ears of the Anatolian shepherds are cropped, but in other countries where ear cropping and tail docking have been outlawed, they have their natural V-shaped hanging ears. There are short and rough coat variations of this breed, and they have high set tails which can be curled and will remain curled no matter the mood of the dog. The classic coloring of the coat is fawn, with a specific black mask on the face, but you can see Anatolian shepherds in all kinds of colors and with all kinds of markings. Anatolian Shepherds are intelligent, independent, calm and loyal dogs, which though are very reserved to strangers and have a strong protective instinct when it comes to their families. So, very serious socialization needs to be done in order to prevent this type of extreme guarding behavior against other dogs or people. This is an ancient flock guardian dog breed originally bred by nomads in China, Tibet, Nepal and in Central Asia. The male dogs from this breed can reach a height of up to 33 inches, and a weight of 100 to 160 lbs. These dogs were used to protect flocks in Asia, which means that they were bred to fight off attacks by large predators such as wolves and leopards. Tibetan Mastiffs are very impressive large dogs with long beautiful coats and tails. They are bound to stop the traffic as you walk around with them wherever you go. But looks aren’t everything. Even though dogs from this breed are kind, patient and loving dogs, they are bred as flock guardians and will often have their own opinion about what they should do. Which is why Tibetan mastiffs are definitely not champions when it comes to obedience or agility competitions. Overall, they are fearless and very protective of their owners. They can get along with children as long as they grow up together, but it is not recommended to bring a Tibetan Mastiff into a home with young children. The problem is the strong protective instinct which may kick in when your child is playing with other kids, which can be mistaken for aggression by the dog. This may cause you to stop inviting guests and play friends for your kids at home. You should socialize the dog properly from an early age to teach it to control these instincts and its natural suspicion of strangers. Also, they are generally quiet at home and can be barkers and diggers if left outside, so it is a good idea to let your dog sleep indoors. The Dogo Argentino is a pack hunting large white dog which originated in Argentina. It was bred to hunt boars and pumas, which is why it is a very large, athletic and strong dog. Dogo Argentino dogs can reach a height of 30 inches and can weigh up to 120 lbs. they are very loyal dogs which are gentle to their families but have a strong prey instinct and can be very protective and distrustful of other animals or humans. This is why this breed is recommended for skilled dog owners only. Dogo Argentino dogs have white and very short coats and can sometimes have a black spot somewhere near one of the eyes or on their heads. They do require a lot of exercise and activity, as well as mental training because if they get bored, they can become destructive. Even though they are naturally bred to get along with the other dogs in the hunting pack, some dogs of this breed have been used as fighting dogs, which is why the breed has been prohibited in a number of countries, including the UK, Australia, Denmark, Singapore, Iceland, and others. Today, Dogo Argentinos are still used for big game hunting, as well as for search and rescue, police and military work. They can be excellent family pets, watchdogs, and loyal companions if they have undergone good training and socialization. Like the St. Bernard, the Greater Swiss mountain dog also comes from the Swiss Alps. It is a heavy boned, strong dog which is fast enough to be an effective working farm dog – as a guard, a herder as well as for pulling heavy carts. The Greater Swiss mountain dog is the oldest Swiss breed and is also the largest of them all. The adult males can reach up to 30 inches in height and over 150 lbs. As a pet, this dog is an intelligent, happy-natured and sociable dog which will get along and show a strong affinity for both children and adults. Swissies are often winners in various dog sports disciplines such as weight pulling and agility because they enjoy staying busy. Swiss Mountain Dogs are rather rare, but have a strong following from their devoted fans. They are beautiful dogs with deep and loud barks. Being so big, the Greater Swiss dogs are not suitable for small apartments. They do need some moderate exercise so you can easily have them as pets as long as you have sufficient space for them at home. If you have a fenced yard – that’s even better. As with the other giant breeds, you must start socializing and training dogs from this breed early on. Puppies must be taught to be friendly with people and with other dogs. They do have a long puppyhood and will remain with a puppy-like mentality up to an age of 3 years. So, even though they are gentle and good with children, a large puppy can accidentally knock over very young kids, which is why you need to supervise it around very small children. The Bully Kutta is often referred to as the Pakistani Mastiff but is actually a decedent of an ancient and now extinct Pakistani dog called Alaunt. It was bred for hunting and fighting and has a strong resemblance with the ancient Mesopotamian and Central Asian warfighting dogs. Bully Kutta means “heavily wrinkled dog” in Urdu. The Bully Kutta is mainly white, but there are other color variations including black, brown brindle, fawn, and bi-colored. They are very large dogs which are about 35 inches tall and can weigh up to 210 lbs. Dogs from this breed are friendly, docile and trainable, which makes them excellent companions and watchdogs for people who have experience with large dogs and can establish themselves in front of the pack before the dog. But keep in mind that they drool a lot and take up a lot of space, so only adopt a Bully Kutta if you can ensure that it has sufficient space. Also, it is not the right dog for families with young children. This rare dog has very thick and strong bones and is one of the strongest dog breeds in the world. Also, its jaws are incredibly strong and provide a very strong grip, as a result of its history of being used for flock guarding and hunting of big game such as cheetahs, lions, bears, tigers, and buffalos. Its lifespan is about 8 to 10 years and it doesn’t require too much exercise, as it will rather sleep all day long instead. The Dogue de Bordeaux is a very muscular and powerful dog which is not as tall as some of the largest breeds (it reaches up to 27 inches) but weighs over 150 lbs. on average. Its head is massive and is probably the biggest head in the canine world when compared to the body size. It was traditionally used as a guard dog, as well as for hauling and pulling heavy objects. The dogs from this French breed, unfortunately, have one of the shortest life spans of all dog breeds and are expected to live for only 5 to 6 years. It is calm inside but energetic and active outdoors, so you will need to ensure it takes daily walks and enjoys some games and play outdoors, before getting back home and snoozing on the couch together for the rest of the day. The Kangal is another gigantic Turkish livestock guardian dog breed which makes it to our list. The Kangal male dog has an average height of 30 to 32 inches and weighs up to 145 lbs. Female Kangals are a bit shorter and lighter. 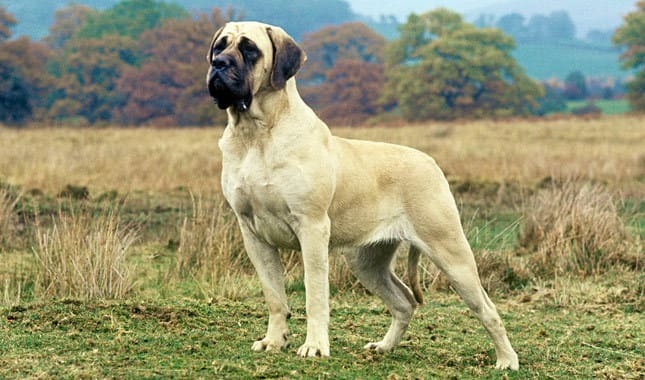 It is not as heavy as some of the Mastiff-type breeds which makes it much agiler and faster than the other large dogs. In fact dogs from this breed can reach a speed of 30 miles per hour! If you socialize it properly, the Kangal will be very friendly to all family members – adults and children alike, as well as to other people. It is an independent and powerful dog, which is calm and controlled and can be very defensive of its family. It is quite inactive indoors but will feel better if you have a fenced large yard, so apartment living is not suitable for dogs from this breed. It is a human-oriented dog which may be aggressive to intruders at night. Regular grooming of the coat is required, especially during the shedding seasons when it does shed heavily. Kangals need both physical and mental stimulation, such as daily jogs, walks or runs, as well as socialization in order to stay calm and happy. Remember, that just like other large dogs, you will need to supervise your Kangal around very small kids, even though it is loving and affectionate, because it may accidentally tip over and injure a baby or toddler. The Landseer looks a lot like a Newfoundland but has a black and white coat. It has similar body proportions and reaches a height of 32 inches and 180 lbs. of weight. It is an unusually sweet, serene and gentle dog breed. The Landseer is also a swimming dog, which is often used for search and rescue of drowning people. It is more responsive and faster than the Newfoundland and thus is easier to train. Having longer legs than the Newfoundland, the Landseer is an elegant, hardy and agile dog with a wide muzzle and small triangular ears. It has webbed feet for faster swimming and a water-repellent coat. If it lives indoors it may lose its oily undercoat. You should avoid shampooing and bathing the dog, unless absolutely necessary. Use dry shampoo to keep it clean instead. Overall, the Landseer is a devoted and dignified dog which has a generous and calm temperament. It is an intelligent and patient dog which can become a very loyal and devoted pet. It is great with children and is a sociable dog which requires companionship. It prefers cooler climates and has a life expectancy of less than 10 years. If you want your Landseer to be completely happy, make sure that you take it somewhere near water so that it can enjoy some swim time! The Akbash is yet another livestock guardian dog originating from Turkey. It can reach up to 34 inches in height and up to 140 lbs. in weight. It is leaner and taller than the other large Turkish livestock guard dog breeds. Its double coat is white but it can have some markings on the ears. Actually, the name of the breed means “white head” in Turkish. The lifespan of the Akbash is about 10 to 11 years. In general, the dogs from this large Turkish breed are calm but always focused and aware when protecting its family or property. As all other big dogs, the Akbash requires serious training and socializing early on in life. It is used to work along with people as partners rather than as a subordinate, which is something to keep in mind when you are training your Akbash dog. It is definitely not for novice dog owners due to its strong protective instincts. But you should never use or strength of cruelty when training it. Rather, a dog from this breed requires firm, kind and consistent training. The Cane Corso is a close cousin of the Neapolitan Mastiff. It is highly valued as a guarding and hunting dog. It has lots of muscles but is not as bulky as the other mastiff breeds. It is also a bit smaller than the Neapolitan Mastiff. The height of the Cane Corso reaches up to 28 inches, and its weight up to 110 lbs. The life expectancy of these elegant dogs is 10 to 12 years. Cane Corso dogs are easy to train and very smart but are also confident and assertive protectors. Their imposing appearance is sufficient to scare away intruders, so you can feel secure at home with your Corso. Again, socialization with dogs and people from an early age is vital if you want to avoid dangerous situations and problems later on with your faithful and devoted personal guard. 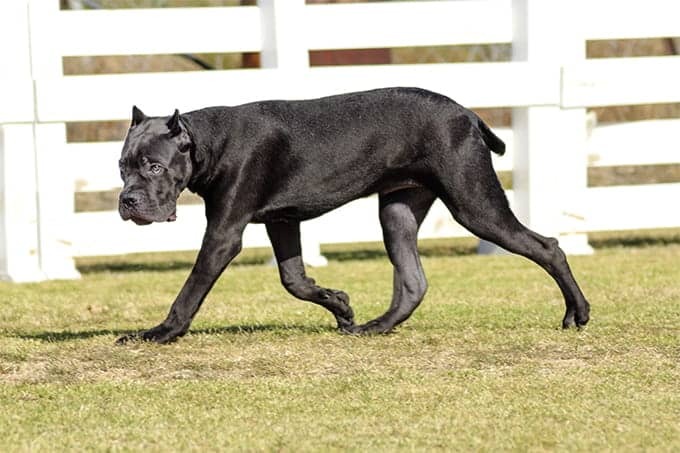 Being bred to hunt big game such as wild boar, as well as to guard properties, the Cane Corso dogs are very powerful and athletic animals. They are suitable for experienced owners who have a large and securely fenced backyard. Corsis are family only dogs, so don’t expect your dog to be friendly with absolutely everybody it meets! There are fossils which show the existence of this breed from the Bronze Age. It is believed that the Pyrenees Mountain Dog originated in Siberia or Central Asia, and later on moved to Europe with the migrants from those areas. It was used as a shepherd dog and has keen eyesight and scent. The Pyrenees is a very large and powerful dog with a thick coat. It is a working dog bred to stop predators such as wolves from attacking and stealing the sheep from its flock. Today, the Pyrenees is a mellow companion and a vigilant guardian of its family and home. Normally dogs from this breed are very calm, but they are always ready to spring into action if a threat is detected. Since it has been bred to work on its own away from its owner, you may have some problems with its training and with the fact that it has a mind of its own. Otherwise, the Pyre is very calm at home and will give you all of its unconditional love, but be prepared that it will guard absolutely everyone and everything on your premises. In order to avoid problems, take the time to socialize your young Pyrenees mountain dog with as many dogs and people as possible as it grows up. Large dogs can be quite impressive and seem a bit intimidating, but if they are properly raised with sufficient socializing and training, most of them can make perfect family pets. Overall, larger dogs are calmer and less energetic than the smaller ones. They tend to be very gentle and affectionate to children, and very loyal to their families. Make sure that you check out the specific requirements for training and socializing of the particular breed you are interested in, as well as its other characteristics, before considering adding a large dog to your family. Unfortunately, larger dogs usually have a much shorter lifespan than that of smaller dog breeds which is also something to consider before adopting a large pup. In most cases, large dogs are recommended for people who have previous experience with dog training and with dogs in general. Keep in mind that some of these dogs are probably taller than you when they stand up and can weigh more than you, so do your research before adopting a large dog, in order to avoid problems and troubles related to the dog’s natural instincts or its huge size and weight! Hopefully, you will soon have a furry little puppy which will grow into one of these beautiful giant creatures, if you have decided that you are up to the challenge of adding an extra large dog to your family!